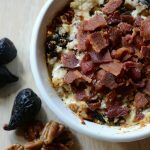 This delicious baked goat cheese appetizer combines the sweet and savory flavors of bacon, candied pecans, wine-braised figs, honey, and creamy goat cheese. It will be the star of your next party! My inspiration for this goat cheese dip came from The Tasting Room wine bar and restaurant in Houston. After one bite, I knew I’d stumbled onto something heavenly. I’ve had many variations of cheese dips in my life, but the combination of flavors and textures in this particular dip knocked my socks off. It has a well balanced creamy-crunchy-chewy texture and salty-sweet flavor profile, and when you add toasted bread to the mix, it becomes perfection on a plate. While the heartiness of this goat cheese dip makes it a perfect winter appetizer or holiday appetizer, it can be served any time of year, especially if you’re looking for something that pairs well with red wine. This recipe does require some advance prep, but once the ingredients are ready, it is super simple to prepare. You can make it easier on yourself by buying candied pecans if you can find them, but if you don’t see them at the store, you can make them yourself in just 5 minutes. 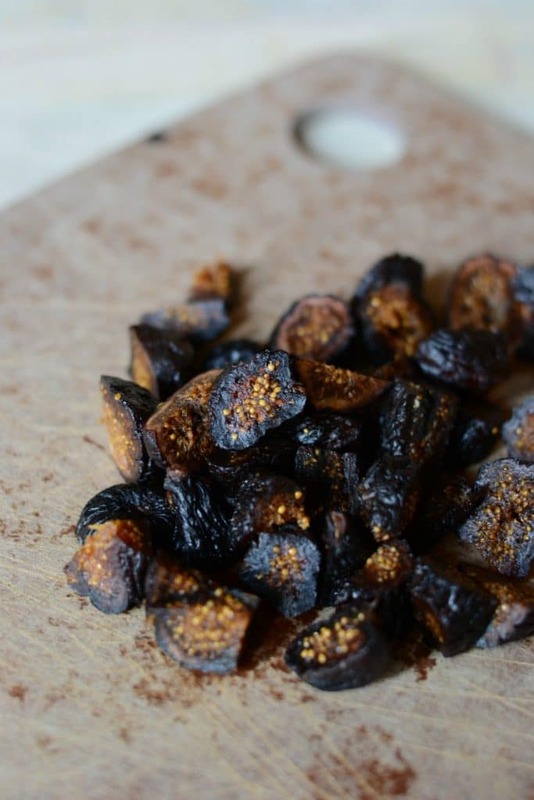 Look for the dried figs in the bulk section of your grocery store, or in the aisle with raisins and other dried fruits. To give the figs an extra punch of flavor, I braised them on the stovetop in a little bit of red wine. This step can be omitted if you want to make things a little easier (or if you don’t keep red wine in the house), but it only takes a few minutes. 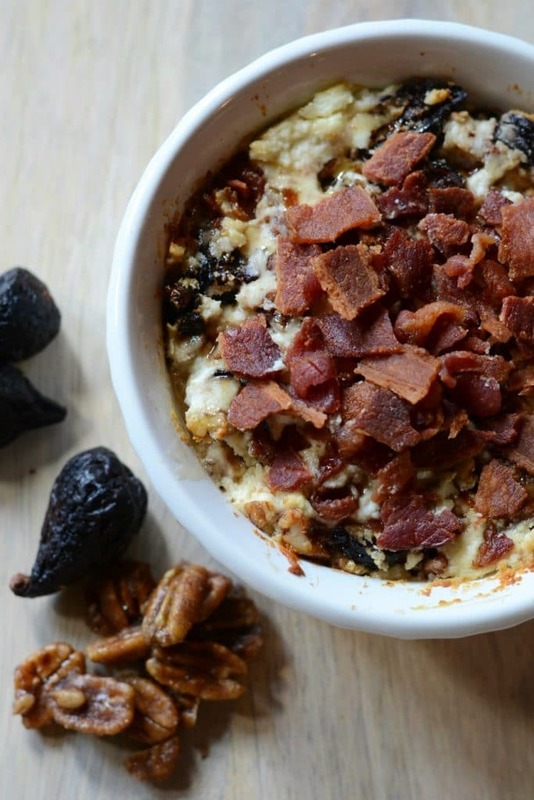 Once the figs and nuts are prepared, you simply soften the goat cheese and stir those ingredients together. While the dip is baking, you crisp up some bacon in the microwave and dice it up. This dip tastes best right out of the oven, but it’s easy to make ahead. 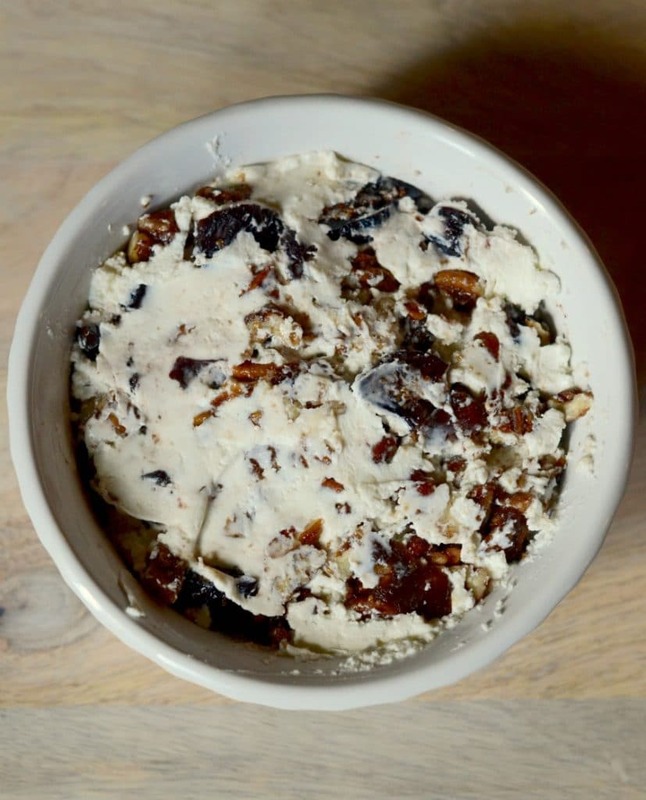 Just prepare the nut, fig, and goat cheese mixture (as pictured above), and then refrigerate until you’re ready to bake. You may need to bake it a few extra minutes if it’s cold, but you won’t have to worry about any last minute scrambling. 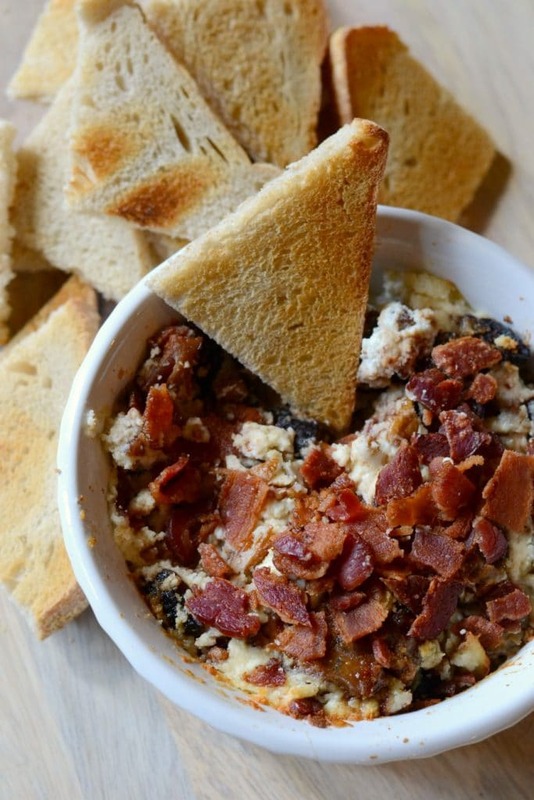 This baked goat cheese dip is comfort food at its finest. 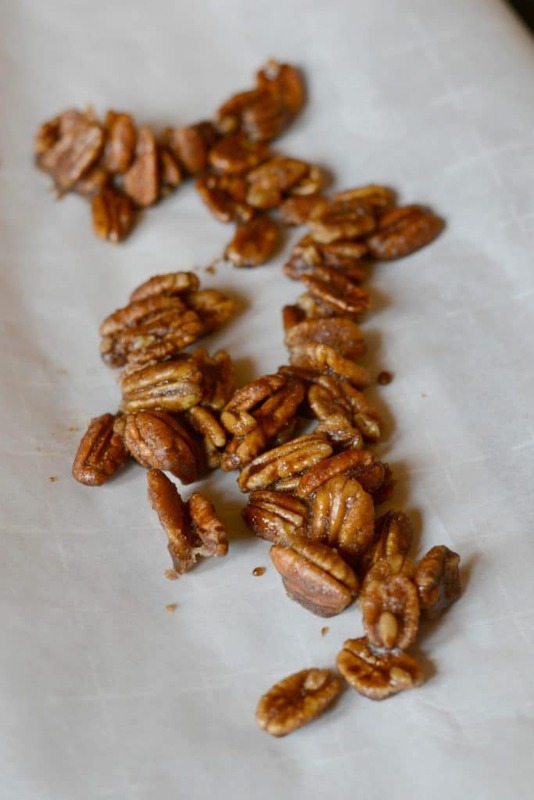 To make candied pecans, combine brown sugar, salt, cinnamon and water in a nonstick skillet. Cook over medium/low heat for 2 minutes until mixture is liquefied and has begun to thicken. Add pecans and stir for 2-3 additional minutes. Remove to a baking sheet lined with parchment paper and allow to cool. Chop into 1/2 inch pieces and set aside. Dice figs into 1/2 - 3/4 inch pieces. In a small saucepan, combine chopped figs with 1 tbsp red wine. Stir over low heat until wine is absorbed into the figs. Set aside. In a small baking dish (approx 6" round), add goat cheese. If not already softened, microwave until soft (30-60 seconds). Using a small spatula, stir in braised figs and candied pecans until combined. Bake in a 400 degree oven for 15-20 minutes, or until the edges are brown and the dip is beginning to bubble. While the dip is baking, microwave bacon slices on high for 5 minutes, or until crisp. Dice into small pieces. Remove dip from oven and top with a generous drizzle of honey and cooked bacon. Serve immediately with toasted baguette slices or toasted bread of your choice. Sweet, savory, creamy, delicious! I love everything about this recipe & love that you can make it ahead of time!